Description: Kids will now be able to enjoy the comfort that adults experience with a comfortable recliner that was made just for them This chair features a strong wood frame with soft foam and then enveloped in durable PU leather for your active child. Choose from an array of colors that will best suit your child's personality or bedroom. This petite sized recliner features storage arms so kids can store items away and retrieve at their convenience. PREMIUM QUALITY - Constructed by sturdy wooden frame , filled by soft sponge, Costzon deluxe sofa is durable for your lovely children. They can read, eat snacks, watch TV on their own furniture with much entertainment to spare the leisure time. 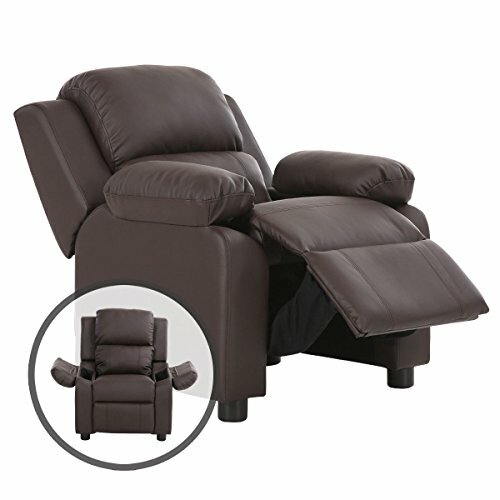 DELUXE COMFORT & RECLINER - Fully padded armrest and headrest offer your children total relaxation while they feel tired. It can also convert to a recliner to meet different requirements. STORAGE ARMS - Flip-up storage arms offer your children suitable space to store little toys, etc.